Arguments began early as Rep. Bob Goodlatte, R-Virginia (Audio) Judiciary Committee Chairman was interrupted during his opening laundry list of complaints directed at Attorney General Eric Holder and the Dept. of Justice (DOJ). Goodlatte named two subcommittees that uncovered conclusive evidence that Asst. Attorney General Thomas Perez struck a secret deal with the city of St. Paul in order to block the Supreme Court from hearing a case. This happened against the strong recommendations of career attorneys and Goodlatte expressed concerns of this emerging pattern. Goodlatte is also alarmed about ignored warnings before the bombing in Boston and the lack of agencies connecting the dots. Also discussed were the Benghazi attack, IRS scandal, AP phone taps, $4.4 billion to compensate thousands of farmers that never claimed bias in court, and the reckless spending at DOJ conferences with $12 cups of coffee, $10,000 pizza parties, duplicate grant programs while Americans are $16 trillion in debt. Many Representatives of Congress asked important questions, some establishing important statements on record for future hearings. Following are notable highlights that have been skipped by various news agencies. Rep. Darrell Issa R – Calif. (Audio) Issa played a tape of Thomas Perez, Assistant Attorney General arranging for something not to be disclosed as part of his quid-pro-quo in St. Paul. After Holder quibbles, Issa offers a hypothetical about trading cases that Holder doesn't want going to the Supreme Court for a dollar damage case. Holder claims it did not end the case. Issa quipped that's not how the abandoned case would view it. 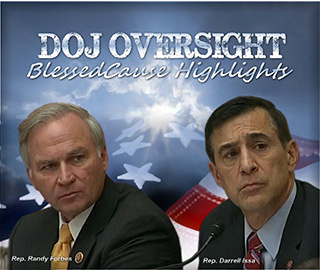 Issa said, "So the American people were denied a Supreme Court decision" and Holder denied it. Issa said the people can decide. Issa then brought up the, "None, then one, then two, then 35 emails that violated the Federal Records Act." Issa was interrupted by Rep Sheila Jackson Lee demanding to know if Holder was given notice of the tape and whether it was authenticated. Issa said it came from the Attorney General's office as evidence. Lee then argued that it was not authenticated to be Perez's voice. Issa responded that Perez has owned up to it. Lee seems to try to argue that Perez cannot authenticate his own voice. Issa brings up many excellent points and arguments ensue all around. Holder states that he did not answer a subpoena with completeness because of judgment that the subpoena had nothing to do with matters at hand. Issa then asks who decides whether subpoenas are appropriate. Rep Randy Forbes R-Virginia (Audio) Forbes discussed the IRS debacle and strategies used to resist testimony. He held a picture of Tyrone Woods and spoke of Benghazi; of Brian Terry and 150 innocent Mexican citizens murdered because of Fast and Furious; of the release of 2,000 immigrant detainees, some held for aggravated felonies; of IRS scandals and no one is accepting responsibility that has any repercussions or ideas of how to change anything. Forbes asks if there is anything that could have been done beforehand. Holder says he accepts responsibility but Forbes articulates that no one has experienced ANY repercussions and nothing is being done to stop the abuses. Forbes expresses concern about IRS abusing health care decisions in like manner. Rep. Trent Franks R-Az (Audio) valiantly brought up the horrors of Gosnell's abortion clinic, including an infant that had no eyes or mouth because of the abortion procedure but screamed as well as it could outside of the womb until it was killed. Franks pointed out that Obama already voted for after birth abortion, but in 2002 Congress enacted the Born Alive Protection Act for every infant born alive. He asked Holder, "Will you enforce the Born Alive Infant Protection Act as Attorney General and will you consider what is happening in clinics across the country, like happened at the clinic that Kermit Gosnell ran?" Holder started to dance but Franks asked if he ever enforced it even one time? There have been 18,000 opportunities a year, Franks wants to know if he has prosecuted even one. Holder countered with saying he didn't know if anyone under President Bush or this administration had ever prosecuted such a case. Franks could hardly say the words as he talked of how we stand by in silence while the most helpless of all children are torturously and agonizingly dismembered day after day and year after year. It is a "heartless disgrace that can't be described by the vocabulary of man. " Rep Zoe Lofgren (Dem), "It seems to me clear that the actions of the department have in fact impaired the First Amendment." Rep Louie Gohmert R- Texas, (Audio) asked Holder if the FBI agents prior to the Boston bombings were allowed to ask the bombers what Mosque they attended, who their favorite imam was and if the FBI was allowed to ask those kinds of questions? Gohmert gave facts about the mosque that the bombers attended. It was started by Alamoudi, a convicted terrorist that worked with the Clintons prior to his arrest. Gohmert articulates how we go after Franklin Graham's [Christian] group but it's hands off when it comes to possibly offending someone who has been radicalized as a terrorist. An argument ensued as Holder responded that Gohmert does not know how the FBI operated and Gohmert responded that this is why Holder is being asked. Frustration is high that questions are not being answered. Watch for Part 2 this weekend.